Supercalifragilisticexpialidocious: 2012? Bring it on! A year draws to an end and another one beckons around the corner, luring us in (as if we had a choice!) with promises of unexplored territories, tears and laughter, friends and foes and a full 366 days of shaping our own lives. 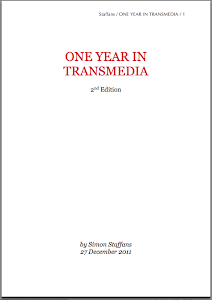 Most of what my 2011 has been about – at least in a professional sense – is possible to read in the publication ”One Year In Transmedia” that was made available for free download yesterday. I won’t go into history further, except to way a genuinely heartfelt Thank You, to everyone I’ve met, talked to, Skyped with, had drinks with, tweeted with, chatted with, blog post commentated with… The tribe that is the transmedia tribe is a trible overflowing with creativity, kindness, curiosity and quite a huge appetite for learning. I’m very happy to call myself a member of this tribe. Looking forward to 2012 I read and watched a great post on a series of interviews with radio personality Ira Glass. The advice is simple, yet profound. "You will be fierce. You will be a warrior...and you will make things that aren't as good as you know in your heart you want them to be… and you'll just make one after another..."
Do listen to the series, it’s great stuff. So this is what I’ll try to do in 2012. Release more often. Fail more often, correct more often. Take feedback more often, evolve more often. Here’s to a great 2012. Hope to meet you all there, at some point.